Three students at East Chapel Hill High School, Brooke, Julia and Danielle, and Environmental Science Teacher, Mr. Edward Kaybay, share their experience starting a pollinator garden at their school. Listen to the interview to hear about their good work! What’s the best way for high school students to learn and understand the value of providing high-quality habitat for imperiled pollinators like the honey bee and Monarch butterfly? Answer – a hands-on project building a garden populated by plants native to southern Orange County, North Carolina. 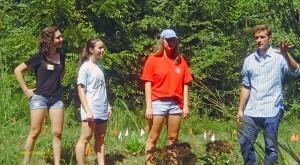 I was alerted to East Chapel Hill High School’s garden project via a Chapel Hill News article in May. Edward Kabay, the enviornmental science teacher, suggested an interview in the fall with the students rather than with him. An excellent idea, as the innovators of the project added a unique level of excitement to the project’s description. When the students, teacher and I toured the garden before the interview, it was the first time the students had seen the garden since the end of the last school year in May. After a tour of the garden with areas designated as wetlands, meadow, and a special area dedicated to different species of milkweed, the host plant for the Monarch butterfly, we adjourned to the air conditioned comfort of a class room. Enjoy the excitement of these three students as they share the story of their dream turned into a reality with the help of the community. I’m going to ask each of you to identify yourselves. Inspiration—what was the inspiration for the project? …how little of a presence there was. But neither of those things actually fanned out like in the way that we had originally envisioned them. They kind of morphed into their own different things that we’re hoping to continue. The composting initiative that we had was actually interesting because we were able to coordinate with the district for that. So we kind of got that started and it had some success early on in the year and it was just a good program that we had in place. We are hoping to make it stronger and increase that presence that we had from last year and that kind of thing. And then, our vegetable garden, we realized wasn’t actually a very sustainable idea. It wasn’t actually in line with our goals. Yeah, that was actually our teacher, Mr. Kaybay, stepped in and he gave our vision more direction. He taught us that a vegetable garden is not really the best idea for a school because it requires really intensive maintenance and it wasn’t even the most beneficial thing to have on campus. The space we have could be better utilized for a native species pollinator garden. Right and a native pollinator garden, the good thing about that is that it’s sustainable and that’s our goal through our E-Stainability Club is to promote sustainability on campus. Was that club alive when you all started this? We founded the club last year. The biggest thing we’ve done in the last year is create a community that is dedicated to the sustainability issues on campus. It’s titled, our club, “E-Stainability” our little club. We gathered a huge presence of students who are interested in our cause with varying degrees of involvement, but we do all sorts of other types of outreach, like this year we did some neat nature walks led by Mr. Kaybay to observe salamanders in their native habitats and snakes too. This one is the state salamander and I think all three of you went on the marbled salamander hike. That was so fun, yes, definitely. Are there any other of the schools in the district copying what you did? Well, I think this Carrboro High School that started the composting initiative at the high school level and we were the second high school to do composting, following all the elementary schools and middle schools in the district. But as for the native pollinator garden, I believe that our school’s the only high school in the district that has started that project. So we are leading in that area. But I know that Carrboro High School has some plans. I think they are considering an edible garden. There are enough sustainability initiatives to go around. When did you all decide sustainability was an important issue to tackle? I know, personally, that’s been a model I lived by. I am part of a really unique family. I suppose where we’ve been taught to really value the environment in everything we do. My mom is a tropical biologist and our home really eco-friendly: our own composting system, to no air conditioning in the summer, low-flow appliances, all of the works! It’s really a life-style I’ve come to know. Interacting with the environment as well as respecting it. I didn’t see that as much in my fellow students and I really wanted to bring that to the forefront of our attention. Yeah, I can definitely say for myself, maybe, my family doesn’t have as many of the exciting, high-tech, environmentally responsible things that Danielle has, but I’ve definitely always grown up in a family where we always have done gardening together, like that was a big thing in my family—that’s how I really connected with my grandmother and just kind of, yeah, my dad works at the Environmental Protection Agency here in RTP, and so we just do, I’ve always felt very connected to the outdoors and interested in gardening and I think that coming to school and not seeing that as reflected here, inspired me to work with Danielle and Brooke in trying to create a community here, so yeah! And so for my family, we had a composting system in our back yard and we had a very flourishing vegetable garden growing up and I was just amazed by how you could start with these little seeds and see them flourish into something incredible. We calculated, one summer, how much money we saved growing our own food and it was like $300! For our family, that was really impressive to be able to see numerically what we had accomplished. That was really great! Have y’all tried to calculate the savings of carbon emissions from anything you’re doing or is that a new project? Sure! There’s all sorts of fun websites where you go and try. It’s definitely clear that an environmentally conscious life-style has big impacts. I know we get our electricity bill monthly and it shows us where we are in comparison to Chapel Hill families, which is a nice visual to show that we’re doing our part. Now you’re needing to gather resources” and you’ve got help, I suspect. Yeah, what part did you all play in working to get the resources that helped you? …an awesome role! They came and visited the garden once we had kind of finished it. We were able to show them what we had accomplished. They were awesome to interact with. They were very generous in saying that they wanted to kind of send volunteers to us maybe in the future! Yeah, and I thought it was really incredible that they were looking to us as volunteers to help them in some of their other initiatives, so we definitely see a path for more involvement with them and we’re so thankful for their support. Let me just jump in right here because I want to get on the record that the resource that these three have brought to this program is community and student body involvement. I know I’ve told them on numerous occasions that knowing myself, I can write great proposals, I can plan budgets, I make species lists, I am not as adept at recruiting volunteers from the community and the student body. And yes, the financial side was very helpful, but equally valuable were these girls promoting the program on Facebook, and Twitter, and making posters throughout the school and getting family members to come build, and digging days, spreading the word throughout the community and really generating enthusiasm behind the goals that we had set for the program, without which I would just be sitting on a pile of money and gardening by myself. Well, what did you do to get the cheerleaders interested? Well I think that just the excitement that we had generated from our workdays and all those people coming out, working together, getting dirty in the garden, doing all this stuff together really generated kind of like a feeling of unity and excitement about it, so once we had actually gotten some stuff done, done some weeding, put some plants in the ground, people started hearing about it and wanted to get involve—wanted to have their piece in the garden. I think that’s where we have the kind of cheerleaders coming, we have a French class planted a tree. We have the Bouncing Bulldog, which is another community organization that kind of is involved with our school a little bit, they planted a tree. So I think after once we had that kind of momentum, this excitement, people were ready to jump in and get on board, so that was awesome to experience. Right, so the Bouncing Bulldogs is a program consisting of about 140 team members and then broader community of about, I would say, hundreds of families and we do jump rope, we promote jump rope throughout the entire world, traveling internationally and competing at various competitions, so there is a community of jumpers here at East, and about, I would say, ten jumpers came out one morning before school to plant a redbud tree with Mr. Kaybay. And these girls who came, they told us before that they had never planted a tree. It was a very great experience for all of us. Mr. Kaybay informed us a little bit about the tree and kind of educated us about how it would bloom throughout the year, and so we planted the tree, and now we can go back and visit it throughout the year. The response afterwards from the jumpers was very positive. That day we could walk away seeing that we had done something good. That was our contribution for the day, and not just that day but throughout the tree’s life. That was very nice. The Bouncing Bulldogs are doing okay, internationally. I keep track of you all. Yeah. I’m hearing that each of you maybe had an interest outside of your E-stainability, so you’ve multiplied your efforts, your interests, your enthusiasm. Like, you’ve taken it to the Bouncing Bulldogs; you’ve gotten the French class involved, the cheerleaders involved. I suspect other departments have noticed that you all are leaders in doing something for our environment. Yeah, we definitely hope that, I don’t know that just everyone’s aware of all the contributions of our whole school to this effort. It’s great to come back to our science classes and be able to talk about what we accomplished [Yeah!] to get other students interested in pursuing such goals. It was definitely exciting to reach out to the academic community; we were all in environmental science class last year. We all took that class. I would constantly be making announcements to my class and trying to get other students who were learning about exactly this during class time to come to our events outside of class to see how what they learned played into the bigger picture. Seed propagation to early—all throughout the year we had club members and other interested parties coming in and getting seed preparation and then like, kind of culminating in this “work weekend” or couple of days where we had this, all of these people coming out and everyone was working. It was just this fun experience. I was so—I couldn’t stop smiling the whole day because, I don’t know, I was so impressed and excited about all the potential that we have now as a club. If we are going to attempt to quantify these things and certainly stretch the reach, I think the reach of this program has stretched beyond anything I imagined it would be last year. But if we were to put numbers to it, we’ve logged somewhere in the neighborhood of volunteer hours across over 100 volunteers over the community and student body, which is not only good for us because we get to plant a great garden and that area out there’s just about a quarter acre and something of that size I’m always amazed about how much work we get done when there are students out there and would not have been possible without investment of the community and these girls and support from our funders that really put us, really made an impact on the campus that we are going to continue to share. Yeah, it was so helpful. Our Facebook page has continued to grow and grow over the summer. I get a notification ever now and then, like “Someone liked your page,” and it’s so good. This interview will be available–a couple of Facebook–[Awesome!] and a potential of a hundred counties agriculture/horticulture agents may listen in. Now, what would happen if they said, “We’d like to start something like that in our county and in our school district.”? And we would be happy to give them all of the resources that we were able to use. I know we got some great support from the North Carolina Botanical Garden in terms of consulting about what plants we should plant, the kind of, the numbers, the diversity and that planning aspect is so helpful. Any expansion of our goals of sustainability like, we would—that’s perfectly what we want to accomplish. Some of the processes that you use? [Yeah! Yeah!] Have you used the soil analysis that is available through the Cooperative Extension? Well, our APS–our environmental science classes went out as classes and took soil samples and then ran some of our own tests on them to determine the composition be it like sand, silt and clay. We were also lucky enough to be able to supplement the soil that we had with some compost that Mr. Kaybay had in his classroom and that we had kind of cultivated over the course of the year, so that was helpful getting them started. We do—yeah, like the girls mentioned, the classes do a little bit of in-house soil testing so we had an idea of what we were getting into. Funding timelines and other things, we knew we were taking some risks that plants were not going to thrive, or need to be moved. We knew there was going to be a learning curve in there. And I am a little behind the curve because I learned of the North Carolina Soil Testing Service, listening to previous episodes of your podcast, and I’m already making notes about how we will use that to compare the results of our in-house soil testing that we do with the students. And that sounds like a great resource, and we will definitely be reaching out when that investigation comes around for the environmental science class. Yeah, you’ll get an entire analysis. I wish you could assign them to listen to the podcast. I might make ‘em listen to it. I won’t even do signouts—make ‘em do it in class. One thing I would tell people who want to replicate this sort of effort. Don’t underestimate the number of resources that are out there once you start looking. We were very fortunate that our grant proposals received funding from the Burt’s Bees Greater Foundation and the Carrboro Chapel Hill Unified School District Public School Foundation provided the bulk of our funding through two different grant proposals. The combination Environmental Consultants and Wetland Mitigation Firm, Water and Land Solutions out of North Raleigh were some professional contacts of mine that partnered with us on our educational signage and both funded and built our really beautiful in-garden signs. They came out on one of the build days and installed them and I’ve received a number of compliments on them. They really, really added a nice, special touch, especially when the plants were really small. People saw the signs and they were an indication that something was going on in the garden. The garden, as it stands now covers about a quarter of an acre. We installed between 400-450 plants, depending on how many of the seedlings that we cultivated in the class. We worked throughout the year to germinate seeds. We stratified milkweed seeds. We scarified then stratified redbud seeds and a lot of the seedlings are now thriving out in the landscape. They represent 40 different species that are native to North Carolina. We were very fortunate to have a partnership with the North Carolina Botanical Gardens. Speaking to your definition of “native”, their focus on native plants and really the plant biodiversity within our immediate area allowed us to draw on a tremendous resource of very, very native plants that come from both the genetic pool and the species that have been found in the area and we have good hopes that the plants that we received came with some adaptation to our specific community. We also like one more—one more thing—we need to thank both the school administration and the school district maintenance department for allowing us total and complete freedom to clear and change and alter and otherwise improve habitats for pollinators on our campus and as educational resources for our environment. Yeah, that was so great. The district is beginning to make inroads with that particular initiative. It is starting in the elementary schools. Bees, themselves, we wanted to establish forage habitat first, before we talk about nest boxes, and maybe way down the road put some other teacher working on it, hives. So that’s sort of a secondary goal and we’ve talked about it. There’s some initial, but we’re not. We are not quite ready yet. We’re focusing on our habitats for right now. It sounds like the concept you all have is that you want to leave behind a legacy and the only thing you take away from your garden are memories. (Laughter) That’s so beautifully put! I think this year, like last year was kind of like really building up the momentum for our cause and getting those accomplishments done, getting the garden in, that kind of thing, and I think this year is going to be about building up our club as like increasing that momentum, carrying that momentum, continuing to improve the garden, but also making sure that we have the infrastructure in place so that it doesn’t fall apart when we graduate. Sure, and also this year, we are excited about the sort of limitless possibilities about places we could go from here. We know that sustainability can take so many forms, so we are excited to see what creative new ideas we come up with and our whole community comes up about ways to improve the environmental sustainability of our school. So I think we are just really excited to see what happens next year. Yes, I think this garden will serve as a living laboratory for years to come and it will be great to come back and see how this garden has been incorporated, specifically into the environmental science program here. We have wonderful teachers and I think this will be just another great resource for us to use. I’m just so excited, kind of like I said before. I want to continue the momentum that we had, especially last spring and just, I don’t know, I just can’t wait is all I can really say. With all of these wonderful people, I’m overjoyed to see where this takes us. I’m just excited about our garden! I want to say “thank you” to Brooke and Julia and Danielle for being willing to work with me on subjects that interest me—native plants, conservation, habitats and providing the necessary enthusiasm to recruit students and the community. And I also want to say thank you again to the Burt’s Bees Greater Good and the Chapel Hill Carrboro Public School Foundation for their financial support and thank you to Water and Land Solutions for all the consultations. And I think I speak for all three of us when I say that we are more than just willing to work with Mr. Kaybay; we are so grateful for all his help and all the resources that he can bring to us. I guess my better ending words that I am amazed how much I’ve learned, individually, by this project. The community effort came through really clearly in the garden, itself, but the individual impact that it had on me was truly profound in all I’ve learned about plant ecology, gardening and just the ecosystem that we have here on campus. I feel privileged to get to hear about your project, from straight from the innovators. We loved talking to you.